The pump runs in constant speed with great throttle loss, a high pressure on outlet, serious damage on pipe, low efficiency and a waste of energy. When the flow is decreasing and the opening is down, increasing pressure differential makes low safety and a big loss in pressure, causing more energy consumption. Long term opening in 40~70% accelerates wear and tear of the valve, leading to bad valve control features. The high pressure of pipe net threatens sealing of the system seriously, leading to valve leakage. Short service time, large routine maintenance and high cost in maintenance cause a tremendous waste of resources. As the system is in mode of two work one spare, so we consider to use one in direct on line, one in variable frequency or both in variable frequency. 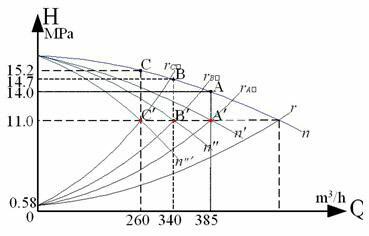 The original H-Q curve shown in Figure 1. The two pumps curve combine into n. On load of 100 MW, the pipe network characteristic is rA'. The work point is A when the valve is fully open. Using valve control, the available point is A when the opening is decreasing. It means the boiler system only needs 11.0Mpa in 100MW load, flow 385m3. The active power of two pumps is PA'. It is corresponding area with"A'-385-0-11.0", and the "A- A'-11.0-14.0" is consumed by valve throttle. The operation conditions of 90MW and 70MW are the same as 100MW. 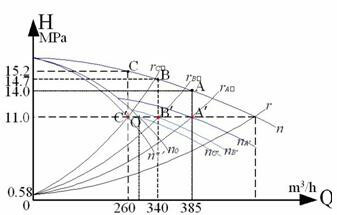 From figure 1, less flow, more throttle loss and lower efficiency. 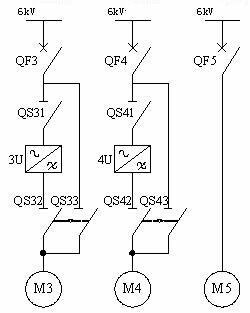 If the system adopts mode of one in direct on line, one in variable frequency, with valve full open, H-Q curve of variable frequency pump is shown n0. In 100MW load, characteristic is rA', the direct on line pump curve is n0, actual pressure is 11.0Mpa, the effective displacement is 270m3/h corresponding to O. After another pump runs in variable frequency, the speed is down. Its curve is nA '. Work point is A'. Active power of pump is PA'. There is no throttle loss any more. 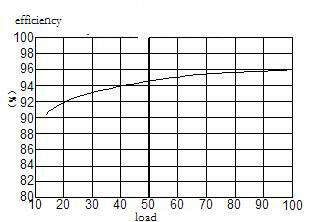 But when the load is 70MW, flow 260 m3/h is less than rated flow 270m3/h. The variable frequency pump can not meet control demand. At this moment, stop line frequency pump and make variable frequency pump meet the system requirements. But one pump operation greatly reduces the safety of the system, it is infeasible. In mode of direct on line &variable frequency operation, throttle adjustment must be used when load is down. Then, the variable frequency pump should make outlet pressure equal to pipe network. The output flow is 0, the operation curve is nC'. The whole efficiency is reduced; and this mode causes system complex, makes against for peak adjustment. Long term running at full load will influence the lifetime of equipment. Therefore, this mode is not suitable for boiler water pump system. For the above reasons, the system should adopt the two pumps in variable frequency. The system adopts mode of one drive one. The main electrical principle of system is shown in figure. Pd: Motor power; d: Motor efficiency; U: Input Voltage; cosφ: Power factor. ①The actual power consumption is shown in the below table. 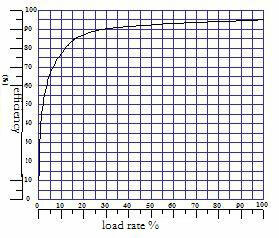 Cd: Annual power consumption; T: Running time of year; δ: The percentage of single-load run time. Therefore, the total power of two pumps in direct on line is 20527817 kW.h. According to above, we could know the work pressure of feed pump. The relationship between motor efficiency and β is shown as figure . 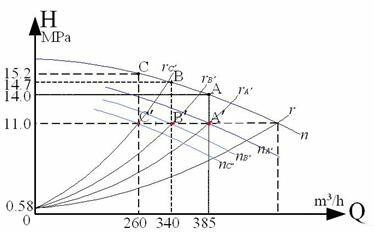 The benefit of reform is not only the economy saving but also with many indirect economic advantages. Eliminate the grid voltage fluctuation when the motor starts. Eliminate the damage to motor when the motor starts at a large current. Increase the lifetime of motor, pipe and valve, reduces the workload of maintenance and costs. Improve the stability of the system automatic device. Provide a reliable guarantee for economy operation of system. The system operating parameters is improved, make the system efficiency higher. The reform of the two pumps by AC drive is feasible. It could achieve the purpose of reducing the rate of plant power consumption, also good for system security, reliability, maintenance and other aspects.